We are Esther and Ilona and we will be your teamcaptains during the NTDS/ETDS! ETDS is the abbreviation for `European Tournament for Dancing Students´. 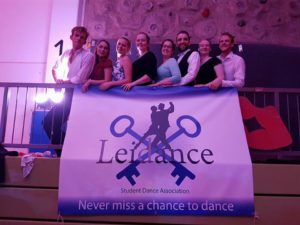 This tournament is organized twice a year and student dancing organizations from all over Europe will participate. And if that isn’t enough, there is also a national tournament, held once a year, called the NTDS (Nederlands Toernooi voor Dansende Studenten). During this tournament you will dance against/with students from all the other Dutch associations/’zusjes’. The NTDS/ETDS is a tournament, but the main reason to come along is because of the nice and welcoming atmosphere. 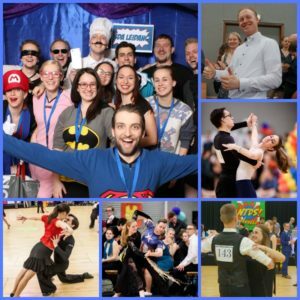 You’ll get to meet lots of new interesting people who love to dance too! People who already participated once during the NTDS/ETDS can confirm: it is just a lot of fun! The actual tournament-part takes place during the day. One day you will dance ballroom and the other day latin. A number of professional adjudicators will divide all the dancing couples in their corresponding categories during the first round of dancing. After this first round you will be on the dance floor with multiple couples who have approximately the same level of dancing qualities as you do. The adjudicators will then decide each round who will advance to the next round. After multiple rounds, only 6 couples will be left to dance in the finals at the end of the day to become winners within their own Category. After you danced your socks off during the tournament-part it is time to dance some more. The party on Saturday is the perfect opportunity to meet other dancing students, make new friends and even learn some new moves! Every tournament there is a different theme (think: ‘Superheroes’, ‘Rock this town’ and even ‘Atlantis’) and everyone dresses up accordingly. The party lasts almost the whole night and we can tell from experience it is amazing! We would love to see you at a next NTDS/ETDS!